Endorsements for Clutter Flow Charts & Go With The Flow! What an innovative way to deliver such important and useful information. You’ve done exactly what Professional Organizers suggest – you’ve broken the organizing process down into small manageable chunks! With the Clutter-Clearing Tool Kit at the ready users are certain to find organizing success. As you all think about ways to appreciate your clients during the Holiday Season, the Photo Clutter Flow Chart may be the solution you were looking for! Enjoy! Clutter is postponed decisions. Growing up on a Nebraska farm, my daddy often used to say, "Half of any job is using the right tool." Hazel Thornton has created a valuable tool you will be able to use for years to come to identify what is truly "clutter" in your life. I LOVE the Clutter flow chart! It’s amazingly easy and fun, how very clever Hazel! Hazel Thornton has done something that few Professional Organizers ever do -- imagined a new way of tackling clutter. Her innovative flow charts help those who are mired in overwhelm to simplify the decision-making process -- both during that crucial "cleaning out" phase, and later on when trying to keep future chaos at bay. This workbook not only brings together all of Hazel's many flow charts (each specifically designed for a different area of your life) -- but also provides you with a handy worksheet and companion articles to accompany each. If you're searching for a way out from under, you're sure to find these tools invaluable in your war against the stacks and piles! Good Morning Hazel -- I have had the chance, finally, to go through your workbook. It is fabulous! What a terrific compilation of your work. This will certainly be a handy tool for me, and an additional tool in my 'client toolbox'. 🙂 Warm regards. 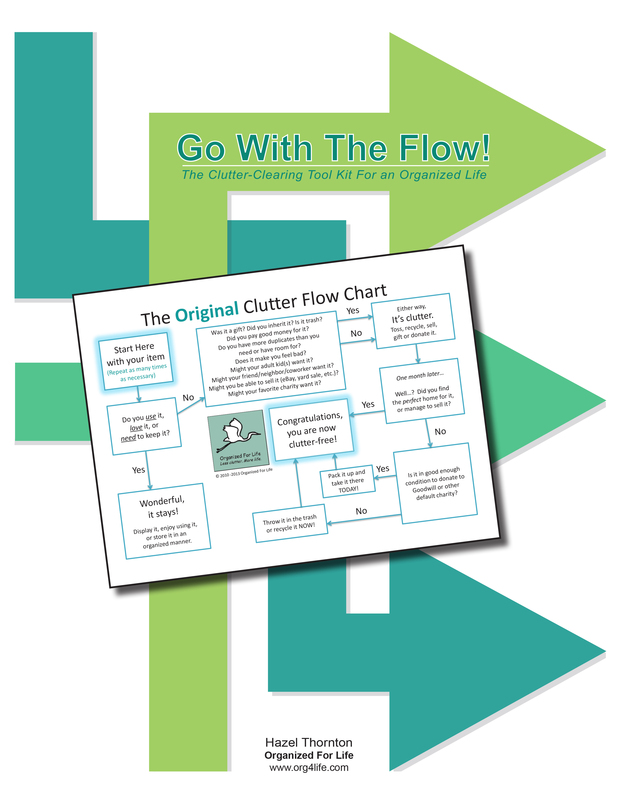 Just ordered 3 more of the Custom-Branded Clutter Flow Charts - they are invaluable for getting the message across. 🙂 Thank you so much! Very nice chart, it really flows! I absolutely love the charts…they make sense, are attractive, easy to follow, and have a bit of humor to boot! CLICK HERE to order "Go WIth The Flow!" ​​​These are wonderful!!! My CD, hoarding and ADD clients love them!! I had them laminated and gave my clients the charts and a dry-erase marker. We go through the chart many times together, then they practice on their own. LOVE THEM! ​​​I love to use flow charts in the magazine. Not only do readers find them fun, but they also walk you step by step which is so helpful. The flow charts Hazel has created are such a great solution to cutting clutter. With just a few simple questions you can be on your way to a more organized life! The Clutter Flow Charts are organized, visually appealing, and I love that they are broken up into bite-size manageable chunks so someone can easily digest a clutter control chart and work on it without feeling overwhelmed. That is sooo key!!! Great job. Hazel, you have really done it now! You have combined all of the great resources from a professional organizer's brain and created and incredible tool for clients who need the accountability of an organizer but may not be able to afford one. Your workbook has such wonderfully easy to follow flow charts with questions that can only be answered with a "yes" or "no" leading each person to the final destination which is a de-cluttered space! But it is so much more than flow charts. Within the workbook each flow chart also includes a full page article, a list of resources, and the best part, a worksheet which will help people be accountable for the action they say they will take. This is simply brilliant! ​I used the flow charts to purge, sort and organize before we moved! ​I’ve been a fan of the Organized 4 Life flowcharts since the very first one; owning the entire set of 15 charts, in one convenient ebook, is almost too good to be true! Go With the Flow! is formatted so that you can easily print out the resources you need to work through various areas in your life. The flowcharts are clear, concise, and easy to follow, but most of all - they’re fun! Each chart is accompanied by an article, a worksheet with helpful examples, and a page of ‘clickable’ links which lead to materials for further reading. By following each step in any of the modules, you will soon feel encouraged and empowered; in fact, difficult decisions will turn into play! Go With the Flow! is a brilliant addition to any library, and one that many of us will return to time and time again. Hi Hazel! Thank you so much for the flowcharts. I used the paper clutter flowchart in my recent newsletter out to my subscribers and clients. I have already received a response from a contact, not a current client, requesting copies of the other flowcharts and articles. Thank you for helping me make use of this great marketing tool! Great flow chart Hazel! The engineer in you is showing. I loved the way these flow charts flow - so simple yet full of direction. I especially appreciate the conversational style and common-sense approach to de-cluttering your kit offers. The Clutter-Clearing Tool Kit clarifies the basic issues and helped me to decide which areas I needed to tackle first. It also showed me how my thinking needed to be tweaked to accomplish my goal of a flowing, clutter-free life. Thanks, Hazel, for these great tools! (The Original) Clutter Flow Chart is easily understood by a wide variety of clients who find it visually appealing and motivating. ​Go With The Flow! The Clutter-Clearing Tool Kit for an Organized Life: is easy to follow, offers clear direction and gives the reader a sense of purpose for whatever clutter issue they are facing. But more importantly Hazel's simple, step by step well-thought-through process provides a feeling of gratification and completion after finishing each project. I would recommend this to homeowners, parents, teachers, business and real estate professionals...anyone searching for a simple solution to organizing their lives. I am a visual learner and so many of our clients are as well. It is just another tool to add to our toolboxes in working with our clients! You rock, Hazel! Thanks for your great Clutter Flow Charts. Love 'em! I find the To-Do List chart to be extremely helpful with my gifted clients.